Brenda Z. 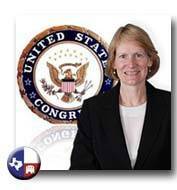 Page has filed to be placed on the Republican 2010 ballot for Texas Congressional District 18 to unseat Sheila Jackson Lee. Texas-raised in a Lutheran home, Brenda Z. Page started working at a young age and kept working. After 24 years in the corporate community she left a successful career to pursue a lifetime dream of attending law school. Today Brenda Page is licensed to practice law in Texas and Florida. She is a Texas mediator. She is a practicing attorney with her own law firm, a general practice emphasizing quality legal services for specialized legal needs. Inquisitive, but shy, Brenda Zimpfer Page was active throughout her childhood participating in school activities and the community: Girl Scouts, marching and concert band, little theatre orchestras. After graduating from Clear Lake High School Brenda entered college. She worked several part-time jobs to pay for tuition, books, food and a place to live, but left before completing her degree. “I felt a strong pull to go to work. I needed to make money in order to support myself and I was eager to dig into a job that I could turn into a career.” Brenda landed an entry level job in the regional stock brokerage firm Rotan Mosle where she worked her way up the ladder into management in clearing operations. She was recruited by various firms and ultimately became vice president and operations manager for a multi-national banking and investment firm. Brenda Page stayed single until age 47. “I didn't want to get married until I met the right guy. The world has so much to offer: I love literature, history, architecture, people, so my best friend and I spent our vacations traveling.” Brenda Page has traveled extensively - England, India, Europe, China, South America, Canada, and throughout the U.S. At SSQQ (a Bellaire Texas dance studio) Brenda met a widowed mariner who “stepped up to the plate” asking her out for a date. Brenda and Mitch married in 2003. Theirs is a true love story. For the first years they lived and worked from home, a 37-foot Lord Nelson Victory Tug, cruising up and down the East Coast Intracoastal Waterway. During their time aboard, Brenda completed her undergraduate degree, and then fulfilled her lifelong dream to attend law school. Brenda and Mitch Page live ashore now in the 18th District. You can follow Brenda Z. Page on Twitter.